Not only collecting ducts can be found in the medulla, also segments of the medullary loops (ansae nephronii) of the medullary nephrons are present. The descending part of the medullary loop comprises the last part of the proximal straight tubule (tubulus rectus proximalis), the thin tubulus attenuatus and the first part of the distal straight tubule (tubulus rectus distalis). The ascending part comprises the last part of the distal straight tubule. In contrast to mammals, the loop thus turns in the distal straight tubule (the 'thick part') and not on the transition between the tubulus attenuatus and distal straight tubule (transition between the 'thin' and 'thick' part). 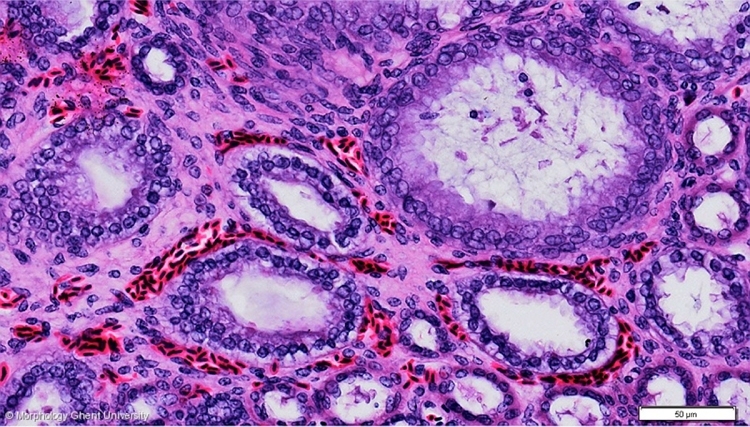 The medullary loop is lined by a low cuboidal to cuboidal epithelium. In between all these structures, capillaries of the medullary capillary network are present.